-How much Photovoltaic costs ? -What you need to get a quote? -How the Sun become energy? Photovoltaic Panels - energy from the sun! What is it and how does a photovoltaic system? 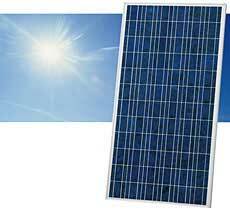 The photovoltaic panel is composed of "modules" that are in turn formed from cells: the photovoltaic cells. These, irradiated by sunlight, then from the "light", thanks to special processes, generate ELECTRICITY continues. The photovoltaic module is composed of these cells. Are electrically connected to each other "in series" and should therefore be to form a robust and easy to handle. Photovoltaic panel will then be constituted by more photovoltaic modules which will be mounted on the same support structure. Each photovoltaic panel will have a nominal power dictated by the number and quality of cells used, ie by the number of photovoltaic modules inside assembled and connected together electrically. The " photovoltaic array " , hit by solar radiation , will produce electricity. 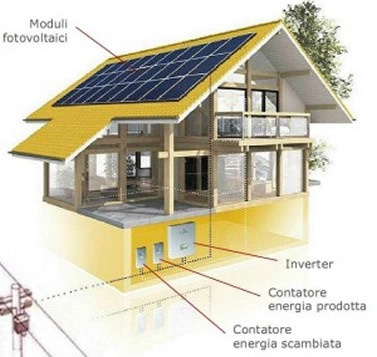 To make the most of the photovoltaic system that optimize the conversion of solar energy into electrical energy will be necessary to better orient our panels : the best orientamente in the longitudinal direction is towards the geographic south so as to benefit the greatest number of hours , while in the vertical direction will position the photovoltaic panels at an angle of inclination with respect to the horizontal plane ( ground ) , called tILT that will be optimal at around 30-33 ° . This will ensure the best angle incidence of the rays on the panels throughout the annual period. L ' angle inclination with respect to the ground ( tilt angle ) is approximately equal to the latitude of the site. The current thus generated will be of the continuous type . To then be fed into the grid , you need a tool that transforms it from alternating current , also quantifying how many kw are produced , ie the INVERTER . Turning the inverter electrical current produced by the photovoltaic system is fed into the electricity grid and you, the owners of the plant will begin to EARN is from 2 DIFFERENT SOURCES: - by the State through the GSE will give you a total kW each product - Enel because the current that consume for your home (or shed or ...) will be subtracted from the current that you put into the network: the result will be to RESET or almost the bill!